Golly, she looks beautiful! I have to laugh. I made myself a red stretch velvet dress for Christmas and it was a disaster. Hated it on me. Your daughter wears the color and the fabric so well. Her shoulders look great to me! That is a lovely dress and your daughter looks gorgeous. What a gorgeous colour! I really don't think that the raglan sleeves draw any unnecessary attention to the shoulder area. The overall effect is very flattering and pretty. Wow! How nice that your daughter sews! And a Christmas wedding.... sigh.... that was on my wish list, but life had other plans! Your daughter looks beautiful and festive in her Christmas dress!! No one would know that there were "challenges" going on all around her while she posed and smiled so prettily. 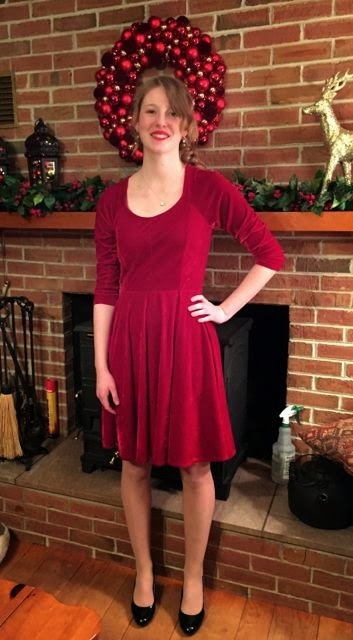 The dress and color look like an excellent choice for a Christmas dress. Hmmmm...easy. You have almost convinced me that I could tackle this one, even with my basic sewing skills. Your daughter looks beautiful in this. The colour is gorgeous. I must check this pattern out! This is a beautiful dress. The colour and style are lovely on your daughter and she is very talented to have made this herself. You must be very proud. Just joined up to follow you on Pinterest. You have some nice stuff pinned! Did you know that you can drag and drop your boards in alphabetized order? I just found that out yesterday.